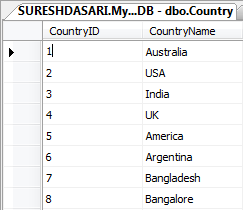 In this article I will explain how to reset identity column value of table in in SQL server. In one situation I deleted all existing records and tried to insert new records in table during that time identity column value starting from previous increased value Ex: Above table contains 8 records after delete all the records if I insert new record CountryID value will start from 9. RESEED specifies that the current identity value should be changed. New_Reseed_Value is the new value to use as the current value of the identity column. to reset the identity column. Checking identity information: current identity value '119', current column value '0'. hi suresh..thanks for the best articles..
i want to start writing blog.. can u plz tell me how to add demos like in these articles to my blog..
Hi,i use gridview to report select the dropdownlist the gridview is bind with different query now i got a problem in paging pls help me. hi suresh im facing same problem thanks good post. suresh bhai small query?which i could not understand? since views are restricting access to rows and colums of the base table?then why we have an option of updating view so that it updates base table?